Snow and Ice Cleats - Double Traction | Classical | SNOW GRABBERS Series | Jia Hao Plastics Factory CO.,LTD. 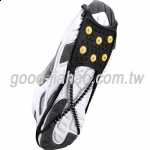 Avoiding slips and falls on ice with anti-slip snow cleats. Excellent traction with 6 spikes on each side to dig into snow or ice, which can reduce the risk while walking on slick surfaces. Cross spiral straps at the bottom ensure stable grip. Three different sizes are available to fit over your footwear comfortably. Excellent traction with 6 spikes on each side. Cross spiral straps at the bottom ensure stable grip.